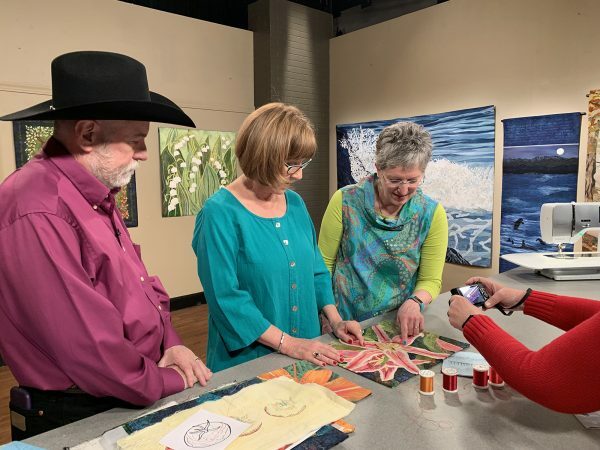 What a delight it was to be invited to tape a show for the Ricky Tims and Alex Anderson online “tv” show, The Quilt Show (TQS)! 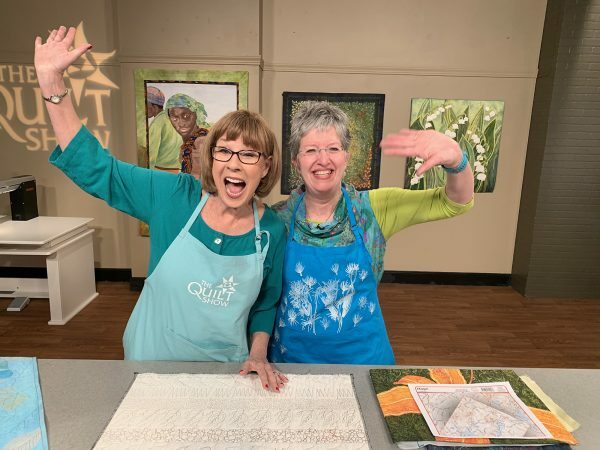 In the past I have taped for two seasons of Quilting Arts TV (on PBS) and did a video workshop for Interweave (Art Quilt Design from Photo to Threadwork, available as a download), but TQS is on a whole other level of professionalism. It was filmed in the Comcast center near Denver…as you walked by the main office there was an entire cabinet of awards including a few Golden Globes! 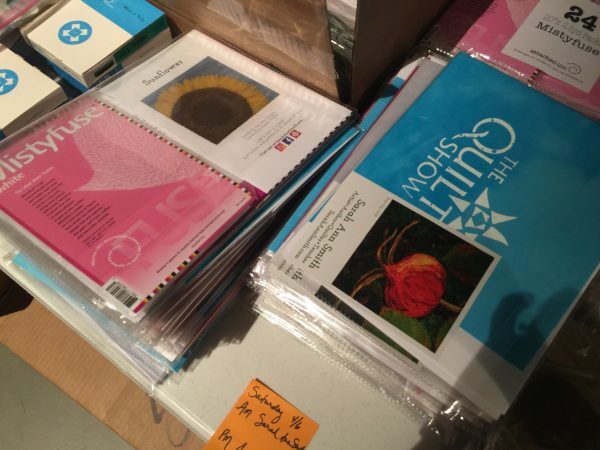 And to get it up front: THANK YOU ADELE Merrell for all these great photos and Gayle Schliemann from Bernina for a bunch more! 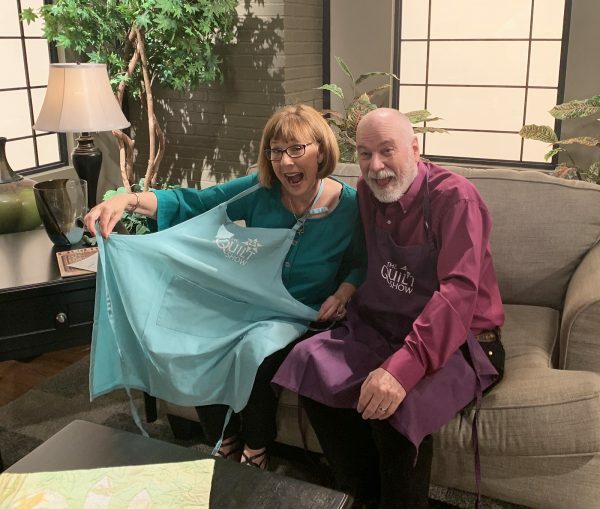 I was so excited that I was able to pull off my surprise gifts for Alex, Ricky, John and Justin: custom TQS aprons made with a thermofax screen I made for them (with behind the scenes help from Producer Shelly to help with a graphic and favorite colors for them). 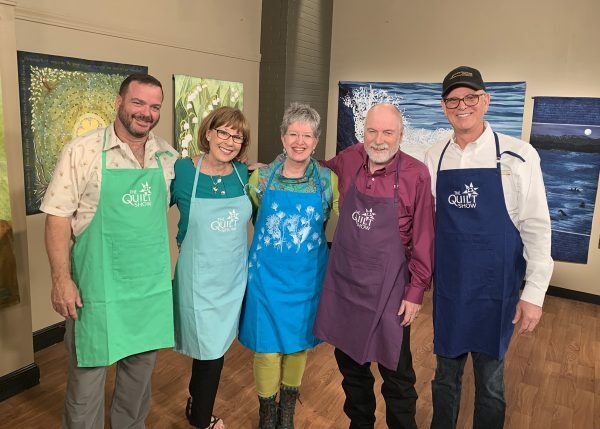 After the intro we got together and everyone modeled their custom TQS aprons. Sorry folks, there are only four of these that exist, but I’m delighted they are already using them with other guests. I bought all cotton colored aprons on Amazon (where else?). If you like the milkweed design on mine, I am selling my custom screens on my website for a limited time (maybe six to 12 months) so you could make your own! And a panorama shot…the detail isn’t great because of the re-sizing I had to do for the blog, but I am standing in the center of the audience area. 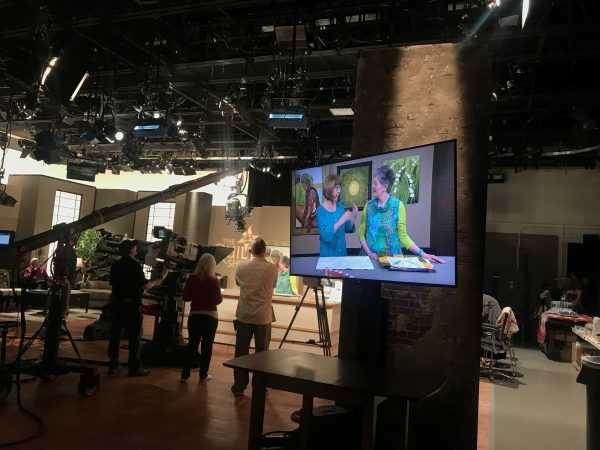 There were four large quilts including this year’s BOM, Sizzle, then the door to the Green Room, a monitor, the areas of the set from the “brick” wall, seating area, gallery space. The big tables are all on rollers as is the longarm and Q20 so everything can be moved easily for each segment. Another monitor on the middle-right, the staff and guest cubbyhole is behind that wall, you can see a long light thing that is the longarm, then Alex’s quilt (which is gorgeous in person) and right bank of the audience seating. There are usually 50-70 guests for each show. 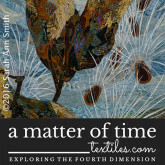 Tickets are free but you must reserve in advance…check the TQS website for info. 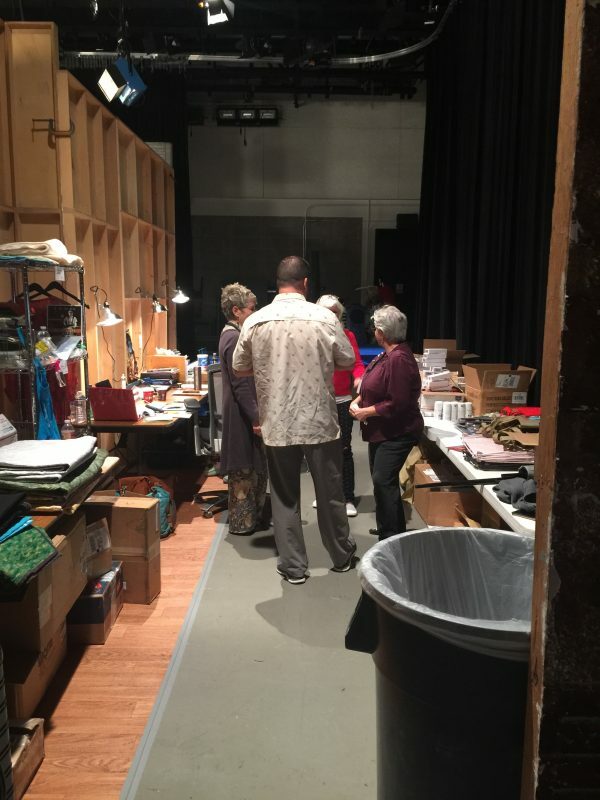 Justin Shults, Ricky’s partner, consults with the team in an area to by one side of the set where they collect the guests’ “stuff” for the episodes and serves as staff work space. I love that they said “welcome to the family.” Everyone staying at the DoubleTree collects in the same zone of the restaurant for breakfast (travel, meals, hotel are on your own dime, but it is so worth it!) and eat together. It is a delightful way to get to know the crew and principals. 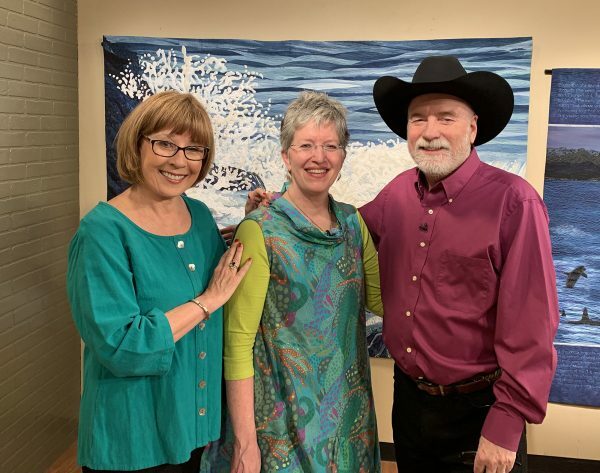 Left to right: Lilo Bowman, Justin Shults, Mary Kay Davis and Katie. 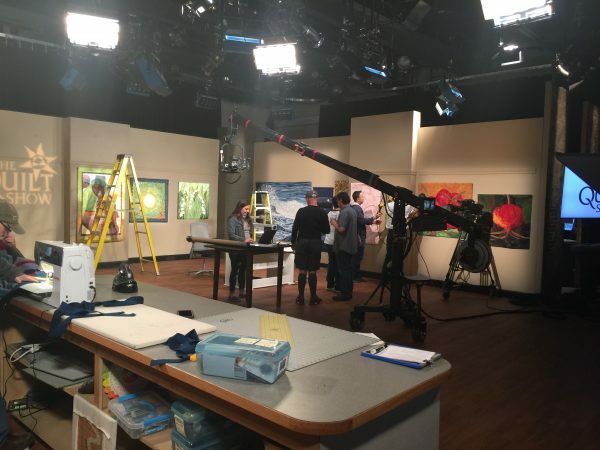 Justin is the guy coordinating things on the set while Shelly Heesacker, the Producer, is in the control room. They communicate by headsets. This is pretty close to the image folks will see when the show airs online sometime this autumn. 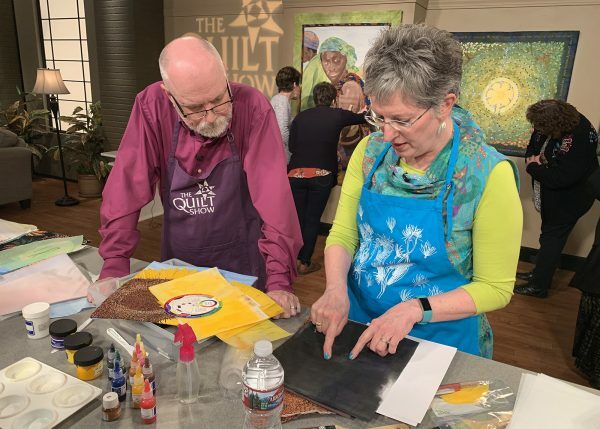 My first segment was about using paint on cloth (and I now have custom paint kits available here) and using shrink fabric to make my sunflower quilt (a blogpost to come). Here Ricky and I reviewed what I brought and what we could fit into the 10-14 minute segment. 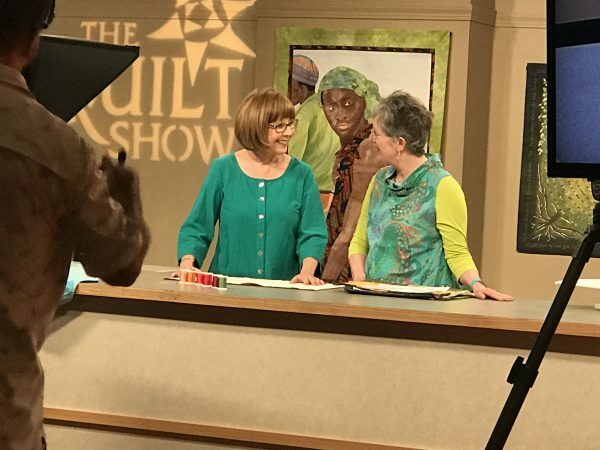 While the guest and hosts review the segments, groups of folks from the audience are allowed to come up and see the quilts up close. 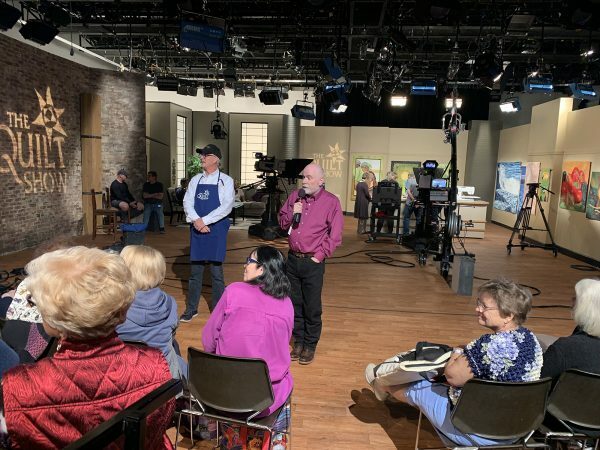 In the breaks between segments, John Anderson (Alex’s husband) keeps the audience entertained, shares quilts from upcoming guests and more. This one is at the end of the day when Ricky came to chat with the audience. 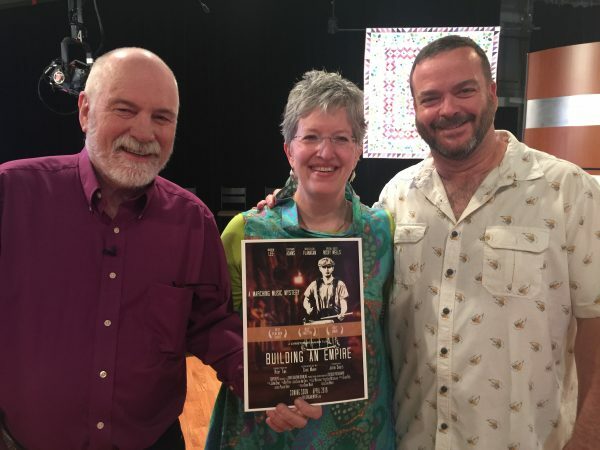 Rehearsing for the thread segment: Ricky, Alex, me and Mary Kay Davis taking a close up photo. Thanks SO MUCH to Adele, who dresses the set, for taking a billion photos for me. I especially wanted this one from inside the control room that shows what a polished and complicated production this is. 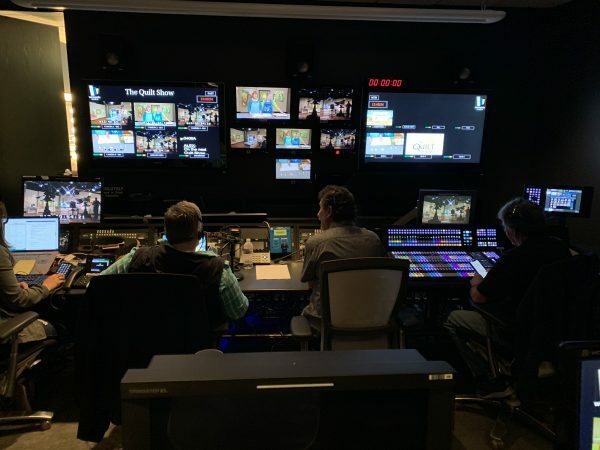 Producer Shelly Heesacker is in the bottom left and she crafts each episode and runs the show. 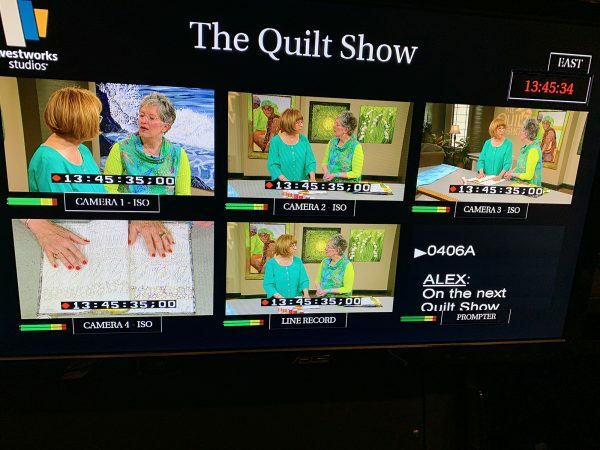 And a close up of the screens as I am taping my second segment, with Alex, on how I do my Threadwork. After-taping shots: here, I am holding a photo by Chris Maher from the online Photo Critique Group–it is a mock movie poster, with Ricky, Justin and many of our classmates in the assorted cast and crew roles. Too much fun! I made TQS screen prints on my hand-dyed fabric for the audience as a little gift. MAJOR thanks to Iris Karp of MistyFuse for donating a package of MF (which changed my life and makes what I do possible!!!!! and that is NO exaggeration) so I made up a pattern for the sunflower that I demonstrated on set. 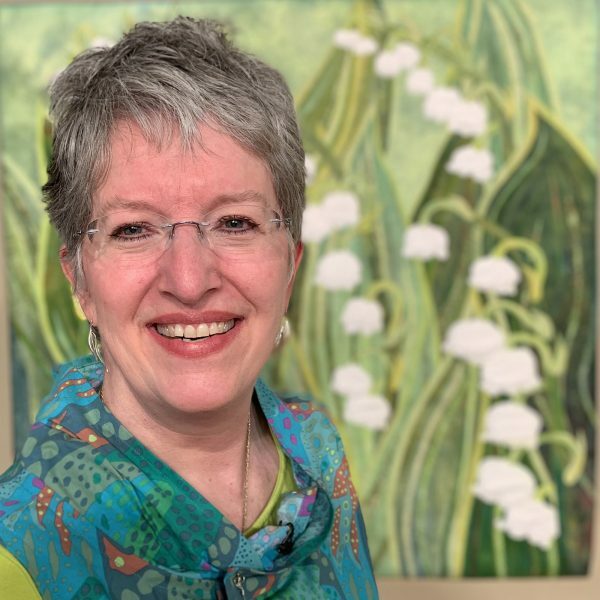 Time for some portrait shots with my quilts…this was one of the best! Going to use this one for my FB profile photo for a while…THANK YOU ADELE! Question and Answer session with the audience (and you can see that fun dress!) after taping. 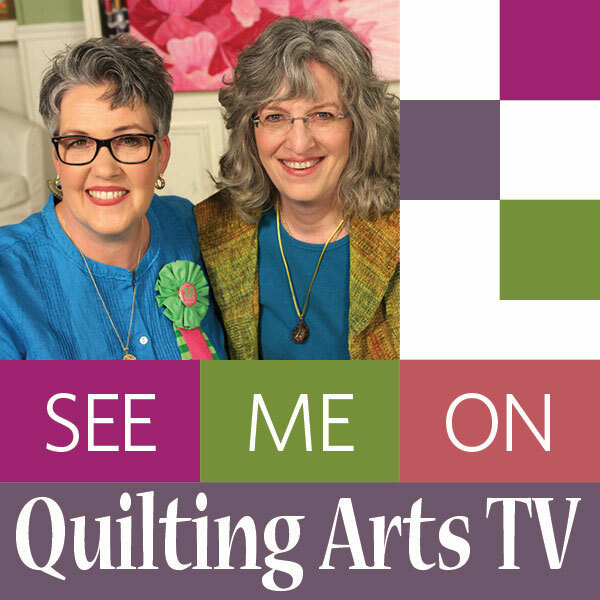 I have to say, I wasn’t all that nervous thanks to being UBER prepared and having done Quilting Arts before, but I was wired for sound LOL..by the time of the Q&A I was relaxed and ready to have even more fun sharing. 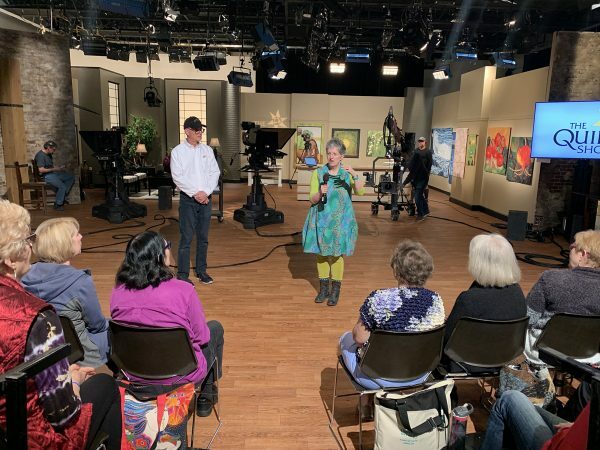 At the end of my segment saying “It’s a new day EVERY day,” the TQS motto. Can you tell we were having fun?!!!! My episode will air sometime in late summer/autumn. 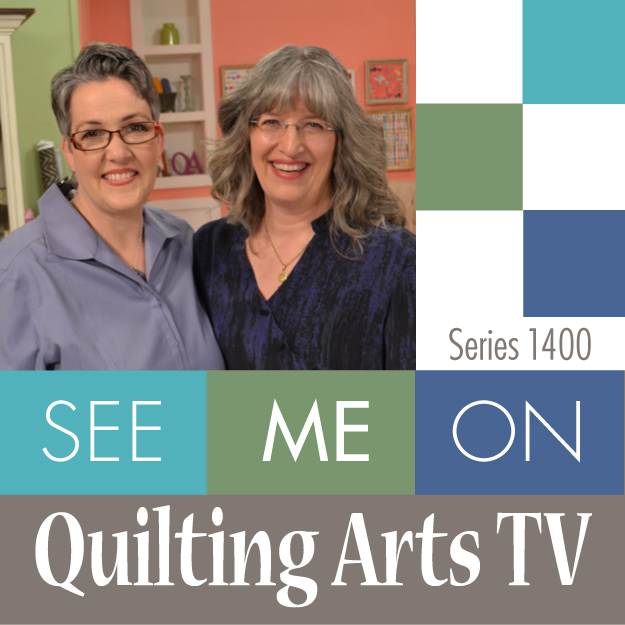 Star Members of The Quilt Show will have the first view, then there will be one week where the episode will be free to everyone. 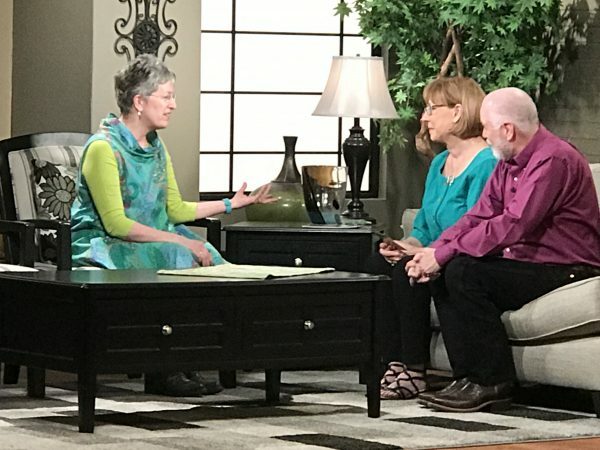 I will be sure to post, but gosh there are so many wonderful guests that I am so glad I am a member–and did you know I joined the very first day TQS began: January 1, 2007? And now, here I am as a guest! WOOT! Life is GOOD!